Leaders jersey, podium presentations and a guess at who will win ATOC in 2016. 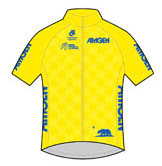 Only the best in a field get to wear one of the four classification jerseys, plus the Tour of California's specific Amgen Breakaway from Cancer Most Courageous jersey. Read more about the jerseys including the blue Breakaway jersey awarded to the rider on each stage who "best exemplifies the character of those engaged in the fight against cancer." 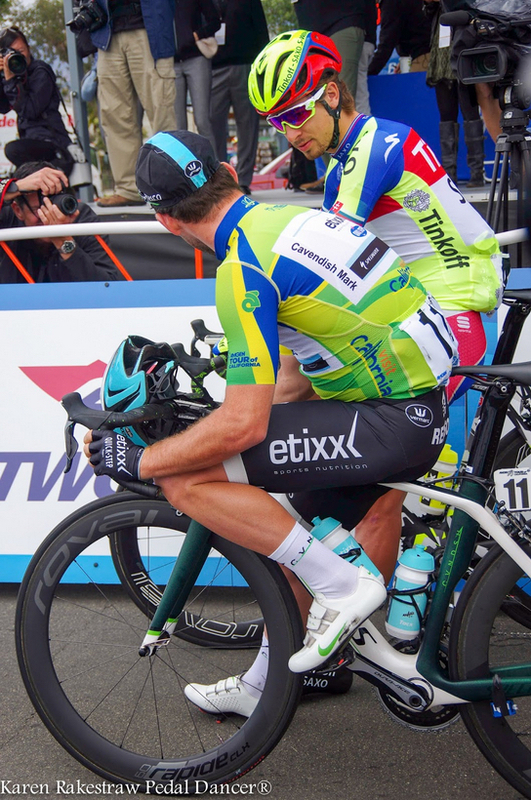 The blue jersey is not a running tally of the best of classification but rather an acknowledgement given to one special rider after each of the eight Tour of California stages. Classification Jerseys for the Amgen Tour of California 2016 are awarded for best type of rider in a field. This year the Tour of California will feature 5 classifications: Leader (fastest overall time, yellow jersey), Mountain (climber, red polka dot jersey), Sprint (faster sprinter, also called points classification, green jersey), Best Young Rider (under age 25, white jersey), Most Courageous (most combative/competitive, blue Breakaway from Cancer jersey). As the stage race progresses the overall classification winner is presented with his jersey after each stage and will wear the jersey at the start of the next day's stage. (An explanation of the jerseys at the official tour website). The designs have changed for 2016. You can buy these jerseys at the ATOC shop. Did you know some races call it Most Aggressive and some call it Courageous or Combative (Read a blog post on the topic: Aggressively Courageous and Combative By Pedal Dancer®). For a fan, watching a podium presentation might be the best way to glimpse your favorite riders close-up and standing still. I recommend heading to the finish line area for the podium presentation, usually 15-minutes after the end of a stage. Within those 15 minutes a lot happens: a designated team soigneur provides quick food and drink to the rider once they have crossed the finish line; congratulations are given and received; a sample is given at the drug screening tent; a quick interview or two might happen; the rider often changes clothes or shoes and replaces his helmet with a hat; and then they are led in a state of great confusion and exhaustion to the location of the podium. Where they sometimes have to climb up metal stairs to the stage in cycling shoes! Before his heart rate has barely recovered the winner gets flowers, a bear and podium kisses. Like a celebrity at the academy awards, photographers call out his name in hopes of getting a gaze straight into the camera's lens. All of this takes practice and training to master, including avoiding blinking, smiling a lot and opening those champagne bottles. You would think every podium presentation would be the same, but a rider never knows that his destination is the stage until after his win or placement has sunk in, approximately 15-minutes prior to the podium presentations. The organization of the athletes, jersey presenters and the flow on stage is the job of the podium girls. Champion Systems is the jersey sponsor for the classification jerseys at the Tour of California. Did you know they quickly iron on those team names patches to the back of a fresh classification jersey after the stage finishes. They know the riders' general jersey sizes and rush the prepared jerseys to the podium where the podium girls and a special presenter, zip the rider into their new classification jersey - backwards. As you can see (below) the back of the jersey, where the zipper is located, is blank. These podium ceremonial jerseys are not the ones worn the next day. Typically they are kept, or are autographed and given as a souvenir. By the stage start of the next day, the 2016 jersey sponsor Champion Systems will nicely print the team logo onto the front of each classification jersey for the day's stage. The team logo is also printed on the back of the jersey along with the rider's name. 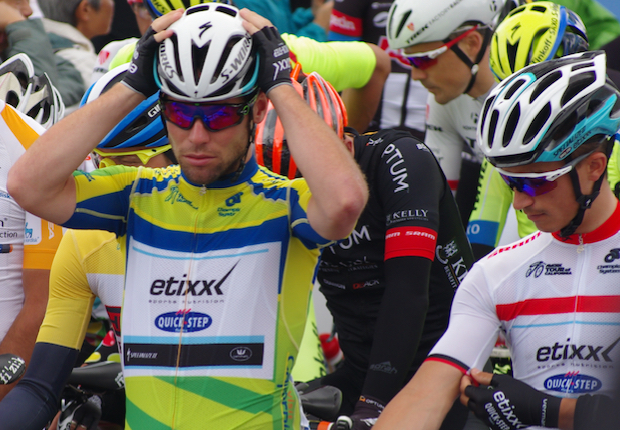 Point Classification Leader (green jersey): Mark Canvendish (then with Etixx-Quickstep, now with Dimension Data). Who will win the Amgen Tour of California in 2016? The start list of riders for the Tour of California should be announced within the next two weeks. No one can foresee the future of a bike race but the fun of being a fan is equal parts anticipation of the great riders who will compete and investing yourself through picking who you think will win. It is what makes sport fun. You might notice many race previews are the same, that is because we are all guessing. All that matters as fans is that over time we learn who is a GC contender, who is a sprinter and who is a climber. And that we dare to participate by guessing. What makes the Amgen Tour of California race so special is that it is preparation for many riders heading to the Tour de France in July, it is also a chance for Pro Continental and Conti riders to strut their stuff against the best WorldTour riders in the world (and thus hoping for a continued or improved team contract). The short eight stage format over a mixed route with sprinting, time trial and climbing also lends itself to an exciting overall winner and attracts world-renowned racers. A new design for 2016.
Who will wear yellow in 2016? That is the great unknown, but I am looking at Peter Sagan (Tinkoff) who won the race in 2015, Rohan Dennis (BMC), Julian Alaphilippe (Etixx-Quickstep), Greg Van Avermaet (BMC), Andrew Talansky (Cannondale), Lawson Craddock (Cannondale), Laurens ten Dam (Giant-Alpecin), or possible past winners Robert Gesink (LottoNL-Jumbo) or Bradley Wiggins (Team Wiggins). 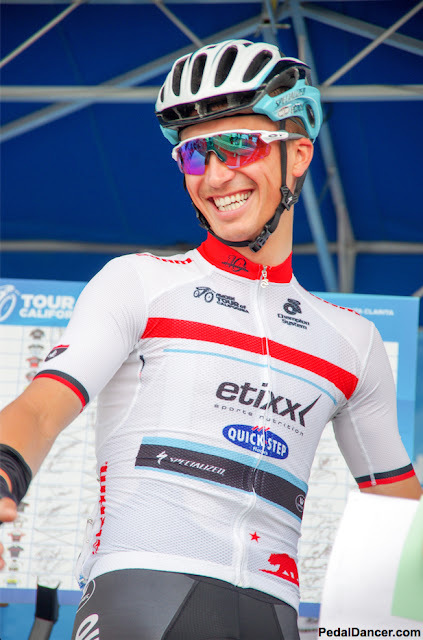 American Peter Stetina is leading the Trek-Segafreda team, and crowd favorite (and social media wizard) American Taylor Phinney (BMC) will be back to animate the race in 2016. I am particularly looking forward to seeing how Lawson Craddock (Cannondale) performs. Who will wear green in 2016? The race for the green jersey (points classification) will be very interesting this year and hotly contested. Watch out for Mark Cavendish (Dimension Data), Peter Sagan (Tinkoff), Alexander Kristoff (Katusha), Rob Britton (Rally), John Degenkolb (Giant-Alpecin), Robin Carpenter (Holowesko-Citadel), Tyler Farrar (Dimension Data), Wouter Wippert (Cannondale), John Murphy (UHC) and many others once we know the true startlist. Who will wear the King of the Mountains jersey in 2016? 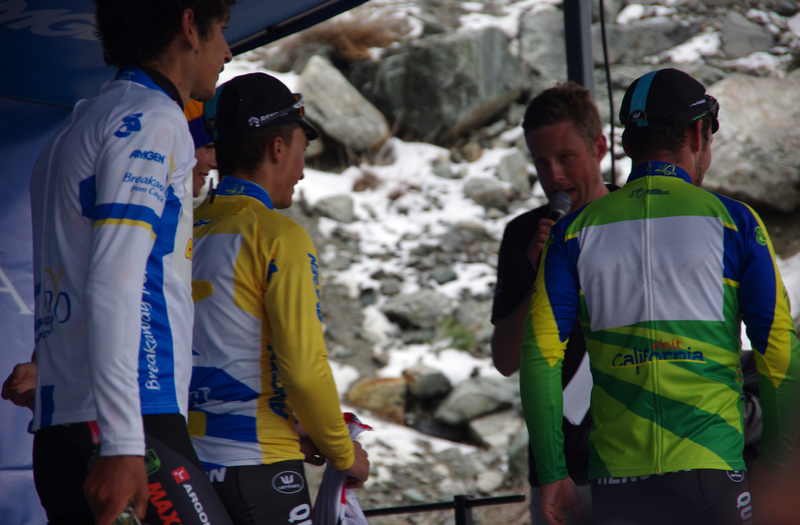 Possibly Toms Skujiņ (Cannondale), Julian Alaphilippe (Etixx-Quickstep), Alex Braico or Lachlan Morton (Jelly Belly). Keep your eye on Logan Owen (Axeon Hagens Berman) recent winner of the U23 Liège-Bastogne-Liège, Julian Alaphilippe (Etixx-Quickstep) winner of the white jersey at the 2015 ATOC, Lachlan Morton (Jelly Belly), Lawson Craddock (Cannondale), Toms Skujiņš (Cannondale), Robin Carpenter (Holowesko-Citadel), Danny van Poppel (SKY), Jasper Stuyven (Trek-Segafreda), and Jon Dibben (Team Wiggins) who recently won the U23 Tour of Flanders. Who will be at the Giro d' Italia and NOT in California? We know the competition at the Tour of California will be high because the line up of 18 teams for the 2016 Tour of California is very impressive. Every year the Giro d'Italia conflicts on the calendar with the Amgen Tour of California. The startlist for the Giro is the earliest indication of who will not be coming to California. Although Fabian Cancellara has not appeared at the ATOC in many years, I was certainly wishing he would be there in his final year of racing before retirement; he will not. King of the Mountain classification winner in 2015 Daniel Oss (BMC) will be racing in Italy at the Giro d'Italia and thus not in the Tour of California to defend his polka-dot jersey. Joe Dombrowski and Michael Woods of Cannondale will both be racing at the Giro. Marcel Kittel (Etixx-Quickstep) will not be in California to join the strong group of sprinters racing for the green jersey. Ryder Hesjedal, Fabian Cancellara, Boy Van Poppel, and Ricardo Zoidl will be representing Trek-Segrafreda in Italy. And American Ian Boswell will be racing the Giro for Team SKY, along with teammate Elia Viviani. Procyclingstats.com has the complete startlist for the 2016 Giro d' Italia. Read an interview with Tour of California Stage Announcer Brad Sohner: Who is that voice on stage? By Pedal Dancer®. Read about Joanna and Allison who have been podium girls at the Tour of California for many years The Fans want Podium Girls?